Inverters are three phase devices and operate at very high frequencies. SCR are not used as the switching devices in these units. IGBT’s (Insulated-gate bipolar transistor) are used for this function. This power semiconductor device is used as an electronic switch. It is known for its high efficiency and fast switching. As we know the AC weld is a sine wave with a positive and negative half cycle and a zero cross over where no power is transmitted. The inverter or mid frequency curve is a single direction with no cross over and provides power the entire time. There is more total power transmitted per unit of time. 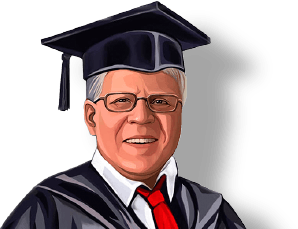 Direct current DC welding has been around for many years. It has been used in heavy duty/high current flow applications to reduce draw on plant primary facilities. In this case DC is powered by three phase power which helps to balance the plant power load. It also operates with a high power factor. DC by definition has the sine wave rectified so that the wave is all positive and never crosses zero. Heating is constant. Large amounts of current and heat can be delivered for large parts or and or conductive materials like aluminum. When should the cooling water be turned on or off to the SCR contactors? 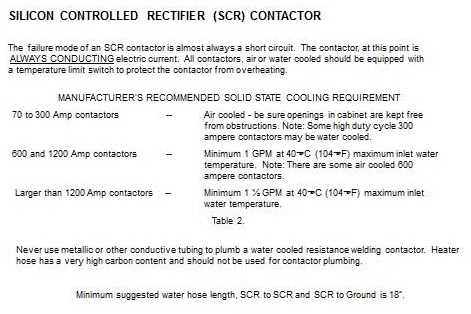 Since SCR’s can fail due to overheating it would seem logical that a simple rule might exist to define when and how cooling water should be turned on or off to the SCR. It is simple always turn on the water when there is power on the SCR and turn the water off when the SCR is off. Weld controls like most other components on a resistance welder conduct large amounts of current. This current can generate heat. This heat must be dissipated for the equipment to operate efficiently. Yes, weld controls must be cooled. Lower amperage units can be air cooled. Higher rated units are water cooled. You must consule your control manufacturer for the recommended cooling requirements for your specific equipment. As an example one manufacturer's equipment recommendations are listed below for air and water cooled SCR equipment. These values do not apply to other brands of equipment. Check with you control manufacturer for the correct cooling procedures.